Rather than head for a nasty divorce, Tom Brady and Bill Belichick reportedly have rekindled an old flame. 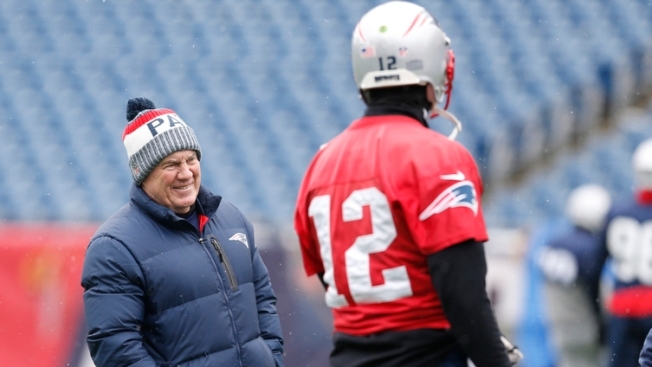 Prior to the Patriots' heartbreaking loss to the Miami Dolphins on Sunday, ESPN's Jeff Darlington offered a glimpse into the quarterback and head coach's relationship that should cheer New England fans up. "I have had a number of conversations with people closely involved with the relationship between Bill Belichick and Tom Brady," Darlington said on ESPN's "Sunday NFL Countdown," as transcribed by WEEI.com. "And then I come out here (in Miami) about 90 minutes ago and we see Belichick and Brady on the field right behind me having this exchange that puts it all into perfect words. "Basically what is happening here, a year ago there was strain on this relationship, there were issues between Belichick and Brady, they were ongoing. But now, suddenly, something has changed. Based on the conversations that I have had, there has been no watershed moment, but suddenly these two guys are communicating better and getting along this year. "As one person put it, ‘they are vibing much more.' It got to a point where it wouldn't have lasted this year if it went like it did last year. Better communication. He's treating Tom more like a 41-year-old man." Reports surfaced last year that Brady and Belichick weren't getting along due to several sticking points, one of which involved Brady's personal trainer, Alex Guerrero. It sounds like the legendary duo -- who are in their 19th season together in New England -- have set their disagreements aside, however. Neither coach nor QB likely is in a good mood this week after Sunday's crushing defeat. But as they prepare for a crucial Week 15 matchup with the Pittsburgh Steelers, it sounds like they'll be on the same page.